The majority of livestock farm production units in Uganda are characterized by low output per animal and unit area, slow growth rates and small-sized mature animals. The units are mainly in or near urban areas and use compounded animal feeds to supplement rations. Animal feeds account for 70% of production costs, thereby having a great impact on the farmers' total production costs and profits. Small-scale dairy, poultry and piggery farms are a source of livelihood to the poor and they also play a vital role in ensuring increased supplies of milk, meat and eggs to the urban populations. However, the production level on these farms is hindered by dependency on a limited number of feed ingredient sources, lack of skilled manpower, limited access to credit facilities, lack of information, knowledge and skills concerning good manufacturing practice in the production of animal feeds, and lack of basic training in animal nutrition and feed milling technology. 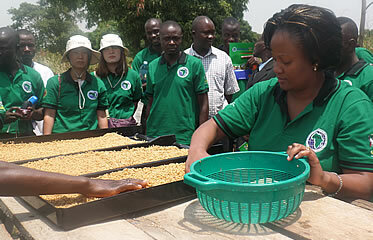 This has led to poor quality feeds on the market, further leading to low livestock and poultry production in Uganda. To drive transformative skills, knowledge, technology, innovation, SMEs (Small-Medium Enterprises) and services into the meat industry and in partnerships, continuously improve production, health, employment, community well-being and economic growth. To provide students with a basic training in animal nutrition, application of feed ingredients and concentrates for animals, aquaculture species and their nutritional consequences. To impart hands-on experience (practical) with the various types of equipment used in feed production and value addition. To produce skilled graduates who are job creators in feeds related enterprises. Target group:Those interested in building attractive industrial, business, professional and service careers associated with the feed production industry. Visit the AFRISA Secretariat in the Veterinary Complex, Makerere University Main Campus.